When Thinking Anew journaling, write your aspirations by hand for 20/30 minutes each morning for 90 days. Be sure to capture the creative thoughts that bubble up while writing. These thoughts will become your success strategy going forward. Use with a fast pencil or pen. Caution: Writing may cause you to know the mind of God as to what you are meant to be. That’s how important you are. Do not drink alcohol when using the power of writing. Ok to take with food. 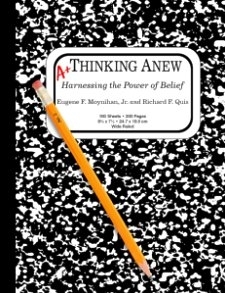 This is a black and white marbled composition book imprinted with the title Thinking Anew: Harnessing the Power of Belief on the front cover. If pregnant or of child bearing age, discuss risks/benefits with your spouse. Refills do not require authorization. May cause you to think differently. Swallow whole – requires a leap of faith in yourself and interaction with your Higher Power. That’s how important this is. Use care not to write while using machinery. Finish all medication unless otherwise directed by your therapist. Federal law does not prohibit the transfer of this knowledge to any other person. Call your therapist, counselor, clinician, life coach for advice about side effects. Expect: Ah ha! Moments, Holy Sh*t moments, Eureka moments and goose bumps. These are feelings and thoughts that you are breaking through and confirmation you are starting to function at a higher level. Do not expect gongs clanging, whistles blowing, bells ringing, flashes of bright light, angels appearing or hearing God’s voice. Humans experience the Divine in numerous and unexpected ways. Internal critics: Ignore your ego as it will fight to maintain the status quo. During moments of doubt, write. This is designed to silence your carping inner voices, catch your censor off guard, outwit and distract your negative thoughts so you can change your habits, challenge your beliefs and re-imagine your life. Don’t quit before the miracle happens; wait for the new you to show up.